Best Defense Against Fire Ants May Be Allergy Shot Offense : Shots - Health News Fire ant stings are a painful fact of life in the South. Sometimes the stings can cause fatal allergic reactions. Yet many people who know they're allergic aren't getting allergy shots that could protect them. The sting of Solenopsis invicta, the red imported fire ant, is well known to many in the Southern United States, but immunotherapy is possible. "Life-threatening fire ant attack" may sound like a B-movie script, but for people living in the Southern third of the United States, it's no joke. These ant stings can cause deadly allergic reactions, but most people aren't getting the allergy shots that could save their lives, a new study says. Fire ants sting people, just like bees do, and 2 to 3 percent of people are allergic to the ant's venom. But where bee stings are rare, fire ant stings are incredibly common for people who live in Texas and other Southern states. "If you go for a walk in the park, or you're playing and you lay down in the grass, you're likely to get stung," says Shayne Stokes, chief of allergy at Luke Air Force Base in Arizona. He worked in San Antonio for five years, a major fire ant hangout. "You're going to be exposed, because they're everywhere." Has he been stung? "Oh, yes." For most people, like Stokes, those stings mean a burning sensation, followed by a red, itchy bump with a pustule. But people who are allergic can have a life-threatening systemic reaction and anaphylactic shock. Stokes found out that people who know they're allergic to fire ants often don't get treatment to avoid those risks. He tracked 71 people in San Antonio who had systemic allergic reactions to fire ant stings, and were told they should get immunotherapy. That builds up a person's tolerance to the allergen over time. Almost three-quarters started getting the monthly shots, but just 35 percent were still at it a year later. The results were reported in the March Annals of Allergy, Asthma, and Immunology. Stokes wasn't too surprised that the threat of death by tiny insect isn't enough to get people to the allergist for a monthly shot. "It is inconvenient," he told Shots. But he says that inconvenience is worth it, because after three years, most people can stop the shots yet maintain the protection indefinitely. "We want people to know that the therapy is highly effective and safe, and can save lives." Shots are an investment not just of time but of money, with each visit costing $25 to $100. That's usually covered by insurance, but would be a big expense for people without coverage. Soreness at the injection site is the most common problem with allergy shots. In rare cases the shots can cause the kind of extreme allergic reactions they're intended to prevent. Patients are usually asked to stay in the doctor's office for 30 minutes after the shot to make sure they're OK. Adults should get immune therapy if they've had hives or other reactions in areas other than the sting site. Children don't need shots if they've had hives, Stokes says, but should if they've had other systemic reactions like nausea and vomiting, a hoarse voice, or difficulty swallowing. 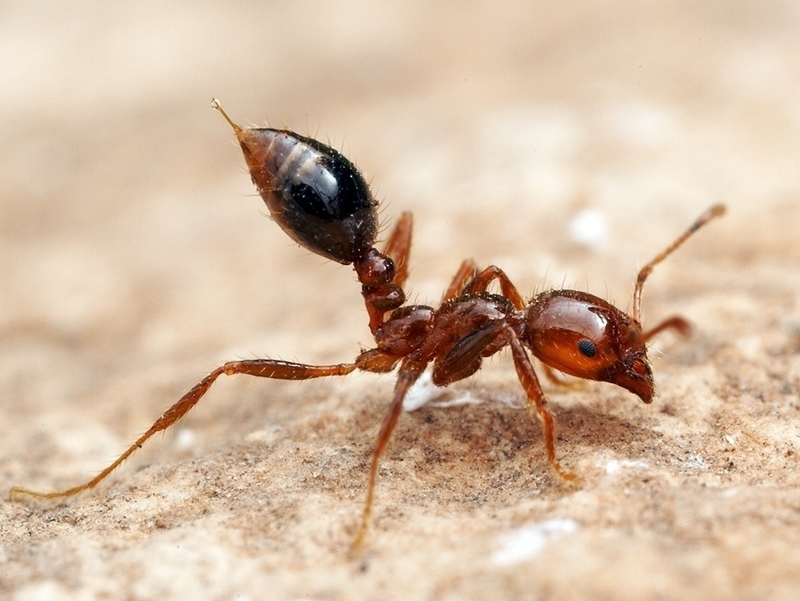 At worst, fire ant allergy can cause anaphylaxis, which can cause cardiac arrest. Fire ant stings are painful, but are not as intense as a bee sting. As a result, "for some patients, their first and only symptom is anaphylactic shock," Stokes says. Fire ants came to the United States from South America in the early 1900s, stowed away aboard the ballast of ships. They've since spread through the South and Southwest, as far north as Virginia, and as far west as Southern California. "Fire ants are a major public nuisance because of their ferocious sting and aggressive behavior," according to the U.S. Department of Agriculture. No kidding. Fire ants are a nightmare for gardeners, children, farm workers, athletes — basically, anyone who would like to be outside. A South Carolina high school football game was postponed after the team's attempts to de-ant the field failed.